It seems like no matter how much you tell kids not to touch or play with things, they end up doing it anyway. Our kids like to play in the backyard and for the most part they stay away from the grill and other things we have out there. The one thing that they find interesting and always want to play around is the A/C unit that is by the side of the house, just inside the fence that separates the front yard from the backyard. I guess it’s just the fact that they can see the fan turning on the inside or that there are a lot of little slots where you can shove small pebbles and sticks in. We tried to keep them away but sometimes when they were outside while we were inside cleaning, they would sneak over to play with it! Something had to be done. That is when we decided that the A/C unit needed a little fence around it. We got the materials that we needed and I got to work. 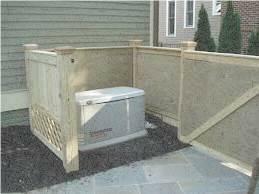 The unit sits on a cement pad so we decided to build the fence around it. The design of the fence is similar to the one seen in the picture below (just imagine it surrounding a cement pad). We put a gate on it with a pad lock so I can get in to maintain the unit and so our kids will stay out. Since we have installed the fence, our kids have stayed away!